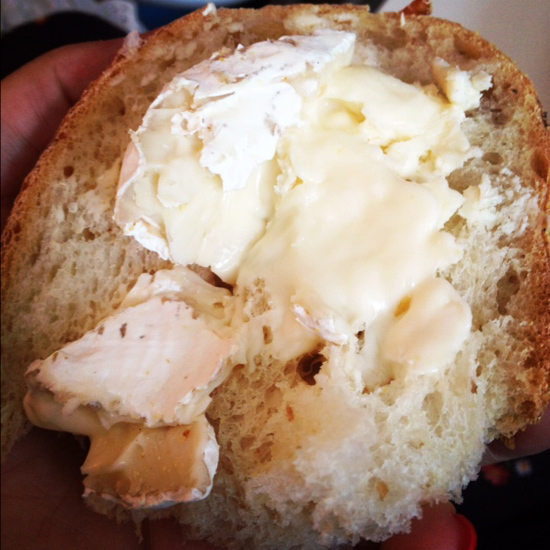 The second and third great bites from the McGolrick Farmer’s Market come from Orwasher’s Bread and Ronnybrook Farms. Enter Orwasher’s amazing sour dough – a loaf which is truly excellent. As a fan of sourdough, I have rarely found any as good as this. Together – they make a delectable treat that is hard to stop gorging on. Oh, Bon Chovie, how I love thee. If I had to pick just one bite at Smorgasburg this would be it. But how to decide between fried (always opt for heads on) and the fresh boquerones? Well, usually only one or the other is available so the choice is made for you. If I was ever called upon to brag about my life as it stands, I think the fact that I can walk down to the waterfront with my awesome baby and husband and eat up fresh anchovies would be a major talking point. Last week we tried and loved Mighty Quinn’s but they’re not the only brisket party in town. Lonestar Empire boasts a juicy meaty sandwich themselves with excellent toppings like pickled onions and jalapeño (both optional but a great idea). More than worth the few extra bucks? The mustardy smashed potatoes that taste like summer barbecues. Another Smorgasburg down another great small dish to rave about. 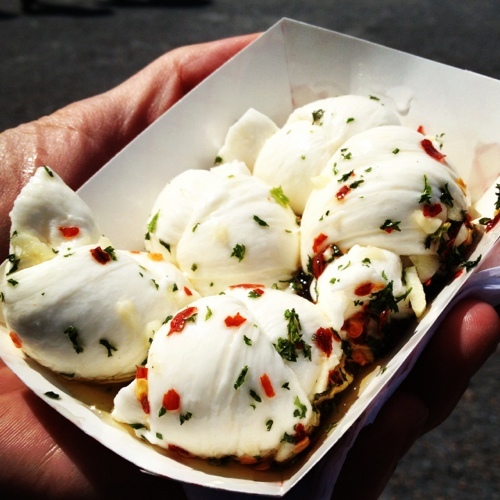 This week I give you a vendor newbie: Mozz Shop. It’s one of the more intriguing additions to the fair – I could watch them churning those big globs of fresh mozzarella all day- but eating it is even sweeter. 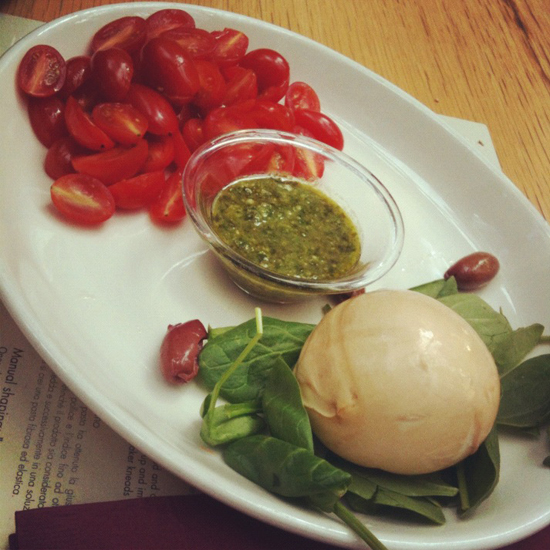 We split the bocconcini – small marinated mozzarella balls with herbs and spices. Easily, these were everyone’s favorite of the day: decadent but simple. Can’t wait to try more of their delectable menu like the “Italian Corn Dogs” made with sausage and mozzarella deep fried in polenta batter. Cafe Mogador in the city has been a long time favorite, always packed, always teaming with famouses like Jake Gyllenhaal and Chloe Sevigny. 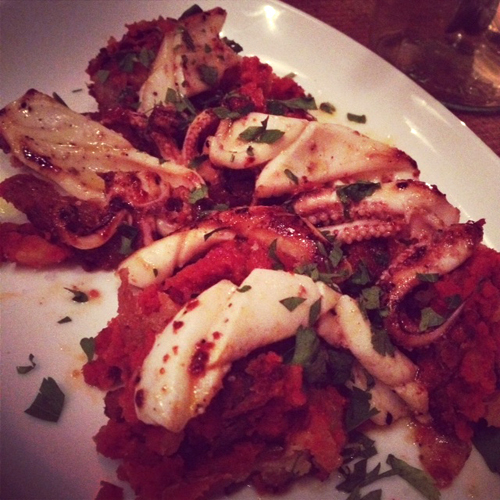 It owes its popularity not just to it’s scene, however, but to flavorful, unique Moroccan food. I was happy to hear it was opening a Williamsburg branch but feared it would be overcrowded. While a steady stream of eaters came and went, it’s not crazy though (at least not yet) and a large back patio and a bright airy space makes it more accommodating than I expected from the somewhat cavernous Manhattan spot. The food hasn’t suffered from the move either. It’s great to have alternatives to the usual Benedict’s and French toasts. In my case, I opted for a flavorful but light halumi tomato and egg dish. Sides are great to share. Spicy carrots, yogurt sauce and hummus were all hits at the table. Service is friendly and efficient and even welcoming to toddlers (which can make it break a meal for us). We will be back to try the dinner menu soon. Smorgasburg is back! I’ve been looking forward to it for months and I will bringing you my favorite bites through out the season. 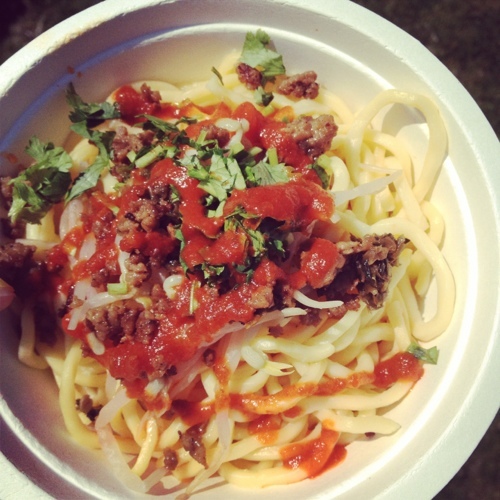 Today I give you Noodle Lane and their Dan Dan noodles. It seems I’m becoming a bit of a Dan Dan noodle connoisseur and these rate high. The ingredients were fresh and there was no holding back on a serious spicy kick – even if you don’t opt for the extra spicy version – so grab a couple extra napkins for brow wiping. I stayed away from Calyer after friends gave it like warm reviews. I don’t often get to go out to dinner, so like warm doesn’t cut it. But a recent birthday party (which the staff was graciously accommodating to such a large group with little notice) brought me to the neighborhood spot and made a believer not only out of me but my friends that were disappointed the first time round. Easy going but upscale, Calyer feels vaguely nautical and features an ever changing eclectic menu. Dishes are meant to be shared but I found that works best with three or so people and only with the appetizer type dishes. The delicious brussel sprouts, for example were served brimming over a large bowl with plenty to go around. 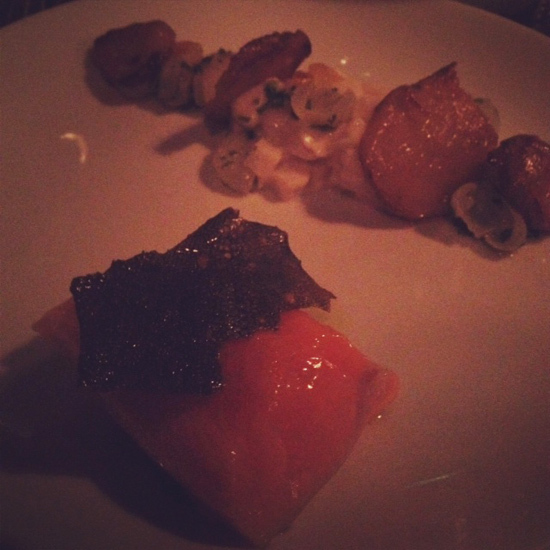 My arctic char, which was really wonderful with each component adding something special was not very large and I was miffed to give any of it away (not that it stopped people from asking). In return, friends traded bites of their steak which has to be one of the richest and most tasty steak dishes I’ve had in a very, very long time. In all, everything was a huge win. The service, the space, the beverages (they made a sparkling lemonade for me) and oh yes, the delectable food. A great date night spot. Sarge’s is a quintessential NY deli that’s been slinging huge sandwiches and egg creams since 1964. It’s famous: the kind of place tourists read about in guide books, regulars frequent religiously, and has head shots of famous visitors plastering the walls – but it’s not necessarily a spot all locals have been. We got our opportunity when a quick doctor appointment left us at lunch time in Midtown with a sitter already watching Van. I jumped at the idea since I have been Reuben crazy lately – mostly because it’s one of the only sandwiches I can have while pregnant due to its steaming hot meat. Here the Reuben is gigantic, it makes your eyes bulge in shock when the plate is presented in front of you. The ingredients are top quality and they give a side of dressing so you can add to your taste. My only qualm is that, truth be told, I think a Reuben benefits from a bit more balance of ingredients – namely less meat – but the jaw busting sandwich is what they do and it’s fun to be part of the tradition. The wash it all down, the egg cream is great. If you fear it will be teaming with tourists, you are correct – and boy, can they be rude. The guy next to us told the life long waitress, before she even had a chance to say hello “Listen can we make this enjoyable for my friend and I? Can we at least try that honey, thanks. And if I want coffee I will ask for it after my meal” in a lazy Southern draw and a Wilson’s leather jacket. At the other table Jersey kids discussed disappointment that you “still had to pay some money” for counterfeit purses in Chinatown. On the plus side, it makes you proud to be a New Yorker. Well, this was a surprise. I’m not much of a waffle fan and I worried instantly that I ordered a too heath food sandwich but Waffle and Wolf was very tasty. 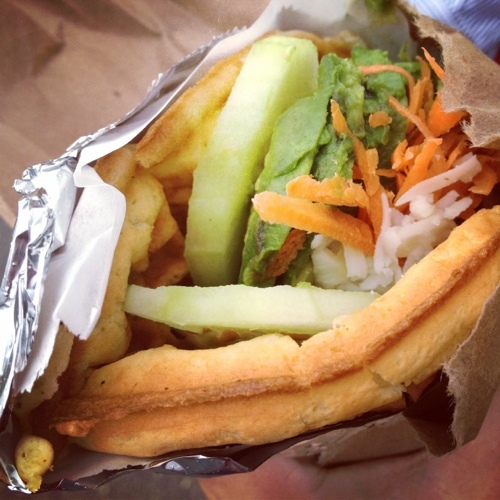 The waffle is soft and pliable, made to perfection to hold your sandwich innards and the ingredients were fresh. It’s a small space and signs warned of a long wait for food when crowded but off hours it was a wonderful, speedy lunch to grab and eat in the park (while squirrel watching – our new favorite park activity). Sweet options are also available and though the cost is higher than expected, it’s cheaper at lunch and a filling meal. 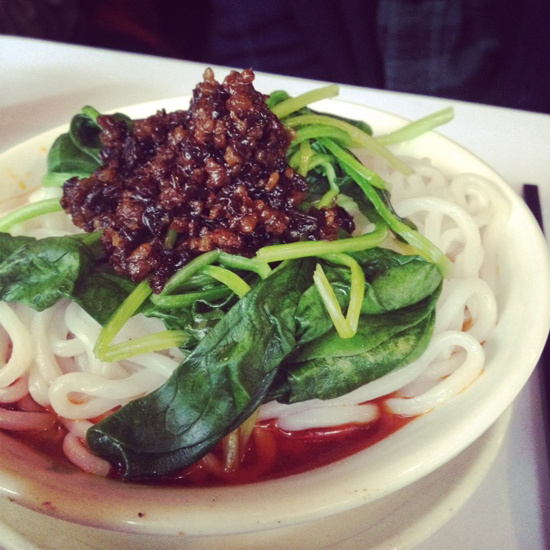 Midtown is the place for awesome Chinese in the city. I am certain of this after a recent mediocre meal in Chinatown and a stellar lunch at Szechuan Gourmet. Across the street from previously recommended and adored Lan Sheng, Gourmet is the more well known of the two and overflowing with happy diners at all hours. While the mouth numbing mala we experienced at Lan Sheng wasn’t here, the food is equally delicious yet unique. My latest litmus seems to be shredded chicken in garlic and here the dish is complex, flavorful and addicting. I simply could not stop eating it long after I was full. Another good marker of a good Chinese place is their hot and sour soup. Done wrong its a gloppy confusing mess that strikes an off chord with your stomach right away. 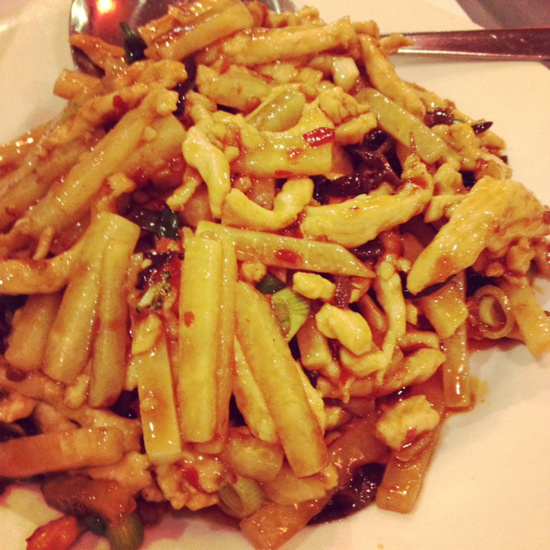 Done right and it’s incredible: thick but not gloppy and punchy with fresh tasting tofu and crunchy bamboo shoots. Here it’s definitely done right. Jim enjoyed the old American favorite General Tso’s which was a delicious challenge to the mall court junk that gives Chinese food a trashy name. Prices are great and the staff is efficient but doesn’t rush you. With this and it’s competitor across the street there’s no excuse to not enjoy good Szechuan in the city. I was glad that part of Sunday bordered on chilly because I had ramen on the brain. And you can’t really do ramen when it’s 65 degrees. Men Kui Tei is a hole in the wall midtown staple, but a clean, friendly hole in the wall that fills up quickly and has slurping ramen lovers coming in and out all day. Since the downtown ramen explosion it’s hard to call Men Kui Tei the best but it’s a hearty yummy bowl. I enjoyed rich tonkastsu broth and perfectly toothsome noodles and liked customizing with the chili oil and vinegar. Mike had the spicy ramen that wasn’t mouth numbing but gave a kick in the back of your throat with each bite. Yes, broth and noodles were excellent, the only thing bringing it down were the toppings. I may have become spoiled by Ippudo’s perfectly roasted pork, but here it was a touch tough and bland and the veggies didn’t taste fresh. Still, my ramen thirst was nicely quenched and it was a perfect filler before braving crowds at the Cindy Sherman show. Poor Shaun thought maybe he was having an allergic reaction, which is not a crazy assumption since it’s such a new sensation if you’re not used to it. I’m just giddy that there are still food experiences out there and ones with physical reactions. Oh and the noodles were delicious besides. I adore Dan Dan noodles. But obviously have never had them quite like these. Appetizer wise, Lan Sheng also boasts yummy mini crab soup dumplings which are worth the wait. My favorite main course had to go to the shredded chicken in spicy garlic sauce. It may sounds hum drum but it was seriously addicting, in fact, I want a dish of if right now! Spicy in a wholly different way is the flavorful lamb cumin which is not for the faint of heart. Be sure to have rice to mellow the heat. 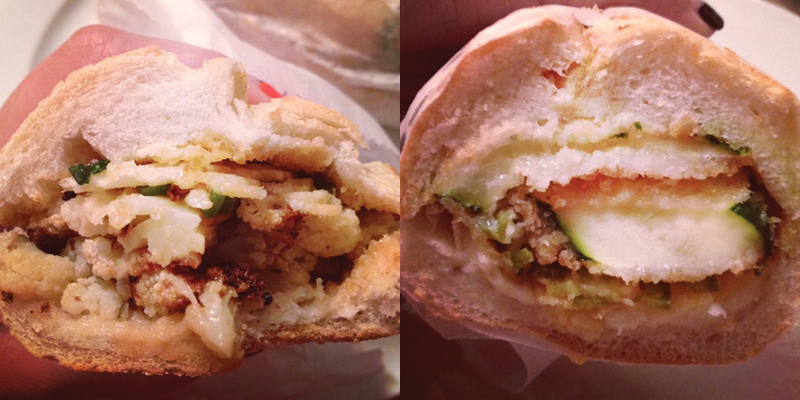 We also split the DIY pork buns which were tasty but filling after so much Szechuan indulgence. It has a special name I’ve forgotten but you can find it in the novel of a menu easily thanks to their handy photos. The place is laid back and clean, the is service efficient and friendly. A perfect spot to eat after seeing the Weegee exhibit at ICP. I’ll definitely go back next time I’m in the area. How could this be true?, I thought skeptically as I read the Yelp reviews (that most of the reviewers admit to being drunk while eating didn’t make me any less dubious). Could God Bless Deli, the polite, but seemingly run-of-the-mill deli down the street really hold the best Philly Cheesesteak around? The answer is: possibly. The first rule is to NOT order with everything as they’ll try to get you to do. “Everything” includes tomatoes, lettuce and mayonnaise – which is just so wrong on a cheese steak. 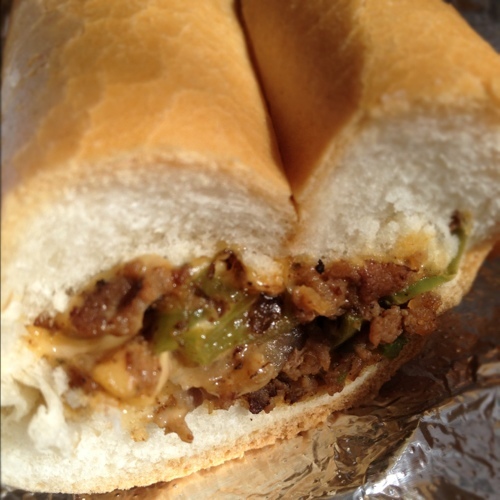 Tell them cheese, peppers and onions only. After that, you’ll end up with a surprisingly tasty sandwich. Philly natives may not be lining out the door for it, but locally, you couldn’t find better. One of the best greasy bites (that’s really not that greasy at all) in Greenpoint or Williamsburg for that matter and only $5. Looks like the drunks were right, and I’m glad. Local hardhats have also caught on and can be seen placing big orders on their lunch break. Welcome to the neighborhood, No.7 Sub, I’m so happy you’re here!! With locations in the hip Ace Hotel and Fort Greene, Greenpoint is the next area to be graced by unique sandwich combinations like the Zucchini Parm: fontina, sweet onion, pickled jalapenos, and BBQ potato chips, and The Roasted Cauliflower: potato chips, scallions, raisins, and smoked French dressing. The sandwiches, served on excellent bread, are not the cheapest you’ll find (at $9) but they’re not your run of the mill bread and fillings. Sides are also worth a few more dollars, particularly the corned beef braised beans. They’ve only just opened and are temporarily serving only after 5pm, but are sure to extend hours soon. Betto didn’t arrive to the crowded Williamsburg restaurant scene with a lot of hoopla but it’s made a huge impression on myself and friends. The food is pretty much spectacular and not outrageously priced. For starters, the flatbread with roasted garlic was really something else. Magic happens when garlic is roasted (reminding me it’s something i should do at home more often) and mixed with warm, fluffy flatbread and a touch of lemon? Well, it was hard to share this one. The crostinis are also a must order. I opted for a thick gooey chicken liver but the options are vast. Salad wise, brussel sprouts were great, sun chokes were good but a bit dull in comparison with other dishes. Main dishes are incouraged to be shared but we found they worked better as individual l dishes (trading bites of course!). I loved my spicy chicken that was bursting with flavor but my friends spaghetti dishes were deliciously comforting and the calamari was tender and well spiced. We finished with a nice cheese plate and a decadent chocolate dessert that could only be described as thick chocolate paste. Delicious but one to share with many. The only complaint was that it was unreasonably chilly but otherwise the atmosphere is inviting and the food perfect. Can’t wait to return. 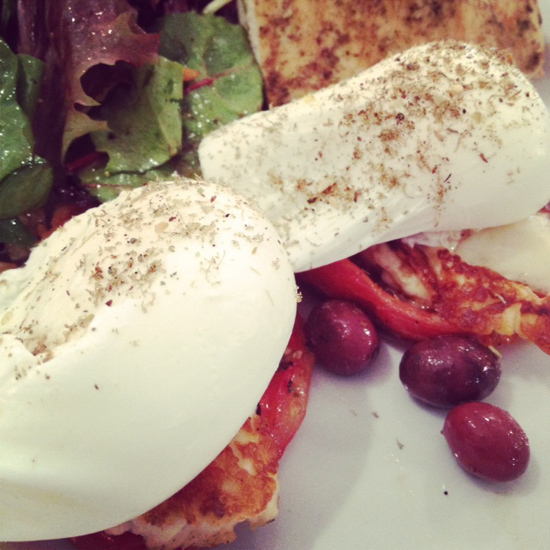 An entire restaurant devoted to fresh mozzarella cheese? Obika is an Italian transplant rather strangely located in the lobby of the midtown IBM building. Sandwiches are available to go but we relaxed a bit and ate from their sit down menu. It took all of three seconds to decide on my order: anchovies, sun dried tomatoes and burata mozzarella though Mike’s meaty salad and Shaun’s smoked mozzarella with pesto and tomatoes were equally good (especially that smoked mozzarella). A great, unique and comparatively affordable lunch spot in an otherwise kind of tough neighborhood for food.